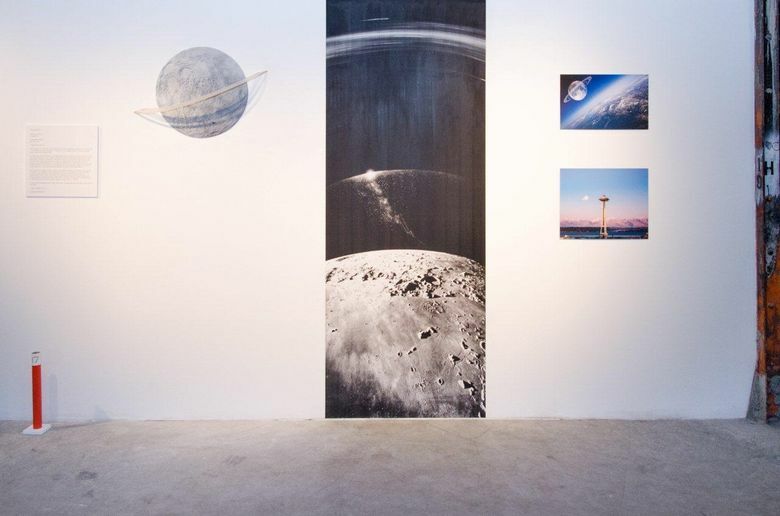 For an exhibit titled “Giant Steps: Artist Residency on the Moon,” submissions meeting strict size and weight parameters came from visionaries — many local but also from as far away as France and Russia — with dreams of lunar installations. 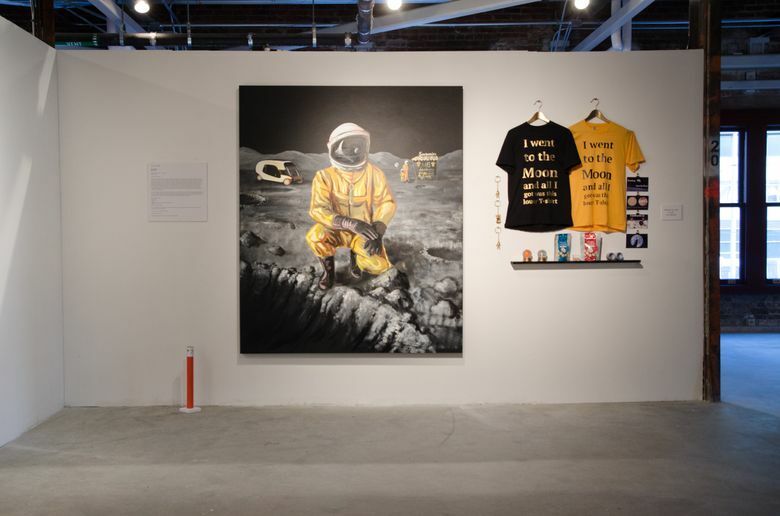 That’s the fantasy invitation offered by “Giant Steps: Artist Residency on the Moon,” a marvelous new show presented by Vital 5 Productions in the vast third-floor exhibition space of King Street Station. 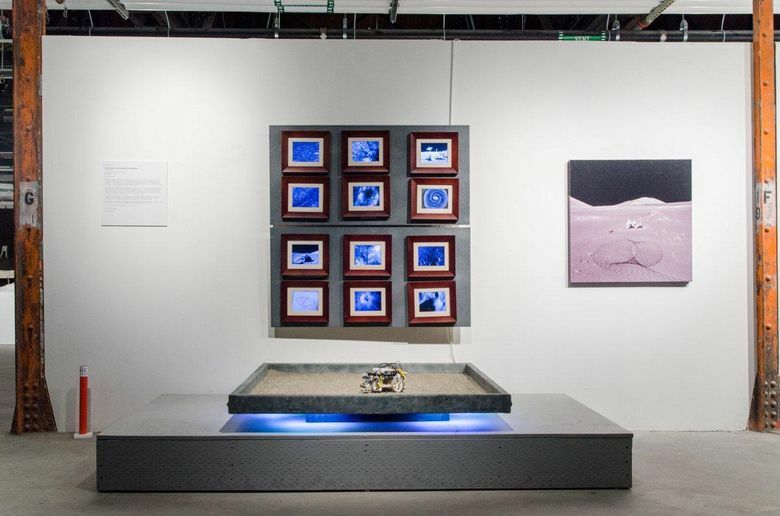 Curated by Greg Lundgren, the exhibit challenges artists to imagine what they’d create if they had 48 hours on the lunar surface with one accompanying astronaut to assist them. Work in any medium was welcome, but certain logistical constraints had to be observed. Noon-6 p.m. Saturdays-Sundays through April 3, Vital 5 Productions at King Street Station, 303 S. Jackson St., Seattle; free (info@vital5productions.com or giantsteps.space). 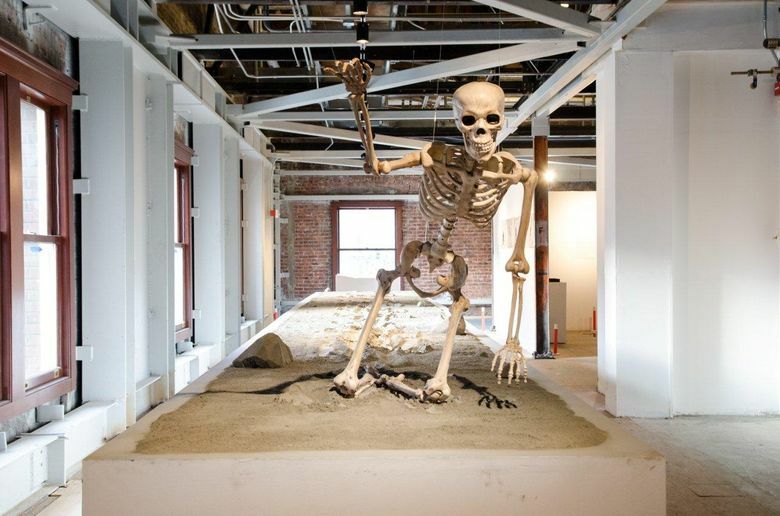 The show is dominated by Seattle artists but includes proposals from as far afield as France and Russia. Some entries are hilarious. Others are sublime or haunting. The proposal essays are often as delightful as the artwork itself. Russian artist Vladimir Petrushevskaya’s “Hard Labor Crater” is a case in point. He’d like to add a man-made crater to an already pockmarked lunar surface (estimated cost: $90). Coming in at $500,000, the artists trio SuttonBeresCuller’s “The Lunar Ring” envisages shooting moon dust into lunar orbit to create a temporary ring that would rival Saturn’s. The Guas’ hope is that it will diffuse nationalist moon-claim rivalries by serving as a proxy for all humanity (“It’s out there, so you don’t have to be”). “MAJOR TOM” has cybernetic competition from the Ballard High School Astro-Physics Club, whose “Autonomous Drawing Robot on the Moon” offers a near-identical idea (minus the Bowie references) for one-tenth the price. Other more budget-conscious proposals include Leah Gerrard’s “Asawa’s Forest” (“a forest of bonsai-like steel trees”), W. Scott Trimble’s “Vikings on the Moon” (a half-scale model of a Viking ship that can fold up to meet the competition’s space/weight requirements), and choreographer Crispin Spaeth’s “When I Say Jump” (imagining dance in a place where gravity’s powers are just one-sixth of those on Earth). Jed Dunkerley’s “Moon Maroon” reminds us of “the damnably hostile conditions that space travel entails.” It consists of a human skeleton that, having dragged itself some distance through moon dust, is reaching out futilely toward its unattainable home planet. 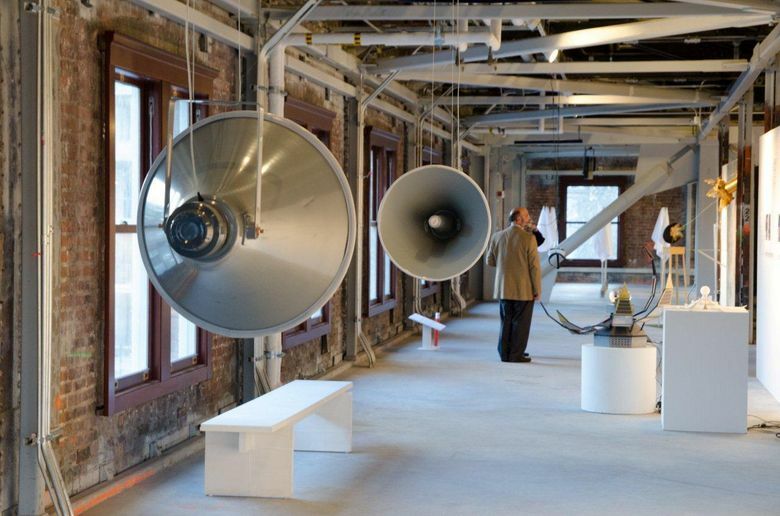 The winner of the juried exhibition’s $10,000 prize, chosen by aerospace and art professionals, is Carrie Bodle and Amaranth Borsuk’s “Wave Signs,” a two-channel sound installation in which continual exchanges of mutating vocabulary (“faded … fated … fetid”) aspire to build “a word ladder to the moon.” A people’s choice award goes to Janet Galore’s “Catalyst Endowment,” which would use a custom-designed 3D printer to create small sculptures from lunar soil. Not every entry matches the ingenuity and enchantment of the best pieces here. But I can’t picture any visitor to this otherworldly show coming away disappointed.